A few weeks ago, I posted a review of Mark Oestreicher book A Beautiful Mess. As I said in that review, it was one of the best student ministry books I have read in a long time. That book is part of a series of books from Group and Simply Youth Ministry called Everyday Youth Ministry. 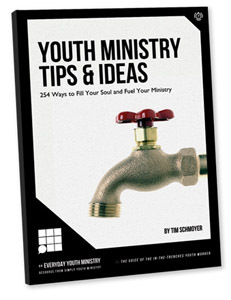 Today I want to share with you another book from that series called Youth Ministry Tips & Ideas by Tim Schmoyer for FREE! I have already downloaded this book and started reading it. So far it’s been really good! Tim shares practical tips and ideas that will help you when you feel like your “stuck” in your student ministry. Sometimes we run out of ideas and this book will help you with that. I would recommend everyone in student ministry to have this book handy for the next time you need a fresh idea or looking for a practical student ministry tip. Founder of Life In Student Ministry and is dedicated to facilitating discussions among Christian youth workers about youth ministry. He is the author of the Youth Specialties/Zondervan book Life In Student Ministry: Practical Conversations on Thriving in Youth Ministry, a national youth leader trainer, speaker, and a super-volunteer at his church.